Violence marred a Donald Trump rally in St. Louis on Friday after security officers wrestled an African-American man to the ground and police escorted another man covered in blood from the Republican presidential front-runner’s event. In all, local police arrested up to 35 people, the St. Louis Post-Dispatch reported. The two incidents, each filmed by witnesses at the rally, add to a growing number of violent incidents that have taken place in recent weeks during speeches by the New York billionaire. The rally at the Peabody Opera House was interrupted numerous times, with six people escorted away by police in the first 30 minutes. "Get him outta here. He's all mouth," Trump said as the first person was thrown out, according to reports by the Post-Dispatch. "Go home to mommy," he said as police ejected the second person. Outside the event, Trump supporters who couldn't get in clashed with protesters, with police being forced to intervene. One white man was restrained by his fellow Trump supporters after a physical confrontation with a black woman, according to the Post-Dispatch report. 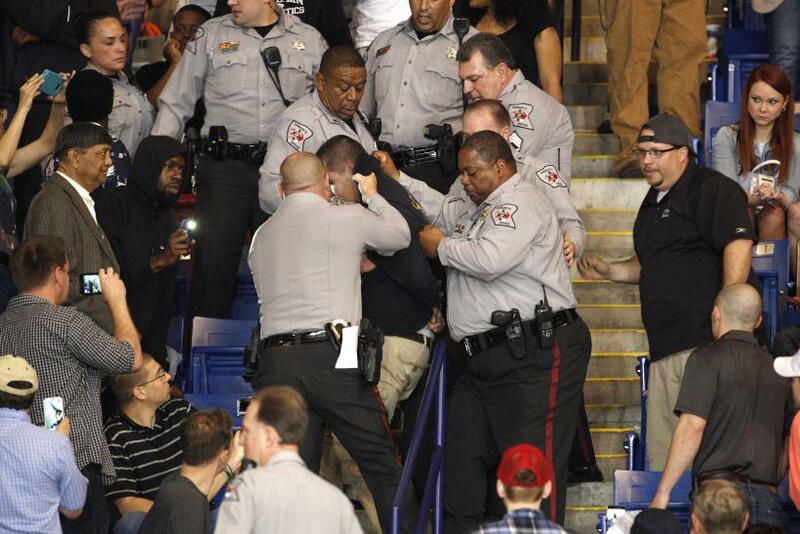 The latest incidents come just two days after another African-American man was aggressively subdued by police during a Trump rally in Fayetteville, North Carolina, moments after he was sucker-punched by a Trump supporter. Police later charged a 78-year-old white male assailant with assault and disorderly conduct, according to a Washington Post report from Friday. During a news conference Friday, where Trump was officially endorsed by Ben Carson, the real estate mogul defended the violence, saying: "These are people that punch. People that are violent people," he said. "The particular one where I said 'I'd like to bang him,' that was a very vicious— a guy who was swinging, very loud, and then started swinging at the audience." Trump continued: "You know what? The audience swung back. And I thought it was very, very appropriate. He was swinging. He was hitting people. And the audience hit back. And that's what we need a little bit more of." Trump was referring to an incident last month in Las Vegas where he told thousands of his supporters that "I'd like to punch him in the face, I tell ya." Democratic front-runner Hillary Clinton quickly condemned Trump for asking protesters to leave his events, saying during an MSNBC interview that she was “appalled” that the businessman had taken to trashing freedom of speech and the right to protest.